I do train quite a bit on the road, more so in the winter when maintaining speed through all the mud on the trails can be challenging. This winter I’ve specifically been on a mission to improve my leg turnover and speed, and to do that I’ve been running more on the road and generally shorter distances. I’ve been training with some of the top marathon guys at my local club, Bournemouth AC, then racing a load of short road races and cross country to really push myself on. It’s been a fun challenge, and will hopefully will translate into a faster ‘cruise’ pace for the longer stuff. I tend to have a set pattern of training each week, although there has to be a degree of fluidity due to work (boo!) and other commitments. On a Tuesday or Wednesday night I’ll do a marathon or interval based session with the club, on Saturday I’ve been doing Parkrun (local 5km) built into a longer run, then Sunday I’ll go out with the marathon guys for a progressive long run around the Purbecks. Now the ultra season is starting, I’ll be ramping up my longs runs at the weekend and be transitioning back to more trail running. I ran track at school and did a handful of fun runs, but I didn’t really get serious about running until I was at university when ran the London Marathon in 2002. I did my first off road ultra in 2004 and haven’t really looked back since. It’s scary to think I’ve been running long stuff for over 10 years now! I go to a Pilates class once a week, then do my own sessions at home to help work on my core. I swim quite a bit, but more so when I’m injured. I’ll get out on the road bike in the warmer months, but I admit to being a fair weather cyclist. I really don’t enjoy getting cold on the bike. I also love sea kayaking and will get out on Poole Harbour at least once a month. 90% of the time without, but occasionally I’ll plug some tunes in during a race to help switch off and stay upbeat during the difficult spells. I would only really do that if I know the trails and it’s not too technical, otherwise it can be a little disorientating. I’ll eat a fairly plain rice based dish the night before a race or long run then Trek flapjack bars/ gels/ bananas during a race and anything in sight afterwards! The North Face FL Race Vest. 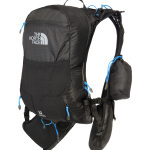 It’s a super comfortable pack-vest which I helped to develop and is my reliable companion on races and training runs. Break the race down into small sections and concentrate on one at a time. Don’t expect to run every step of the way. It’s usually more efficient and sustainable to take short walk breaks to help conserve energy and allow your body to go further. Start eating early then little and often throughout. It gets harder to stomach food the further you go, so don’t leave it too late. Recce the route in sections beforehand. Mentally it is so much easier to prepare yourself when you know exactly what’s ahead. Keep smiling, even when it really hurts. It works! Stubbornness, determination and the desire to always be the best I possibly can be. The trick with ultra running is to really ‘want it’. If you get your head right beforehand, it will lead your body through the adventure.